An Arm Chair can be a piece of furniture passed down from generation to generation. The important thing is quality. The Flynn has the classic lines and style that transcends generations. This style has been popular for many years and is particularly suitable to placement in the living room or bedroom. Cheap armchairs are everywhere, but you get what you pay for. The Flynn is and Australian Made arm chair, manufactured using Australian raw materials. Flynn arm chairs are for sale at Devlin Lounges, and quite often are on sale to ensure we are very competitive on price and flexible in relation to your fabric choice. The Flynn is made in Australia, using Australian sourced raw materials. The frame is constructed from furniture grade pine and MDF. The seating is made from high quality webbing and Dunlop foam – revered as the best seating foam in Australia. You can choose from any of the wide range of fabrics available from Warwick Fabrics, Australia’s leading fabric house. An arm chair made to order, in your fabric? 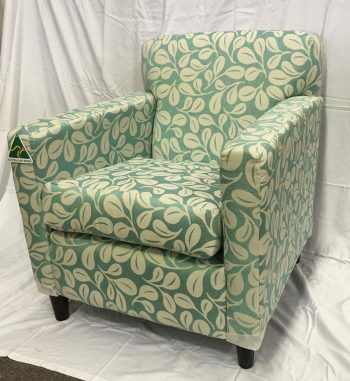 If you are looking for a quality arm chair in Brisbane, Gold Coast, Sunshine Coast or Toowoomba, why not come down to see us and see and feel the quality you get for a portion of he price you may for a similar product at the Top End of Town.